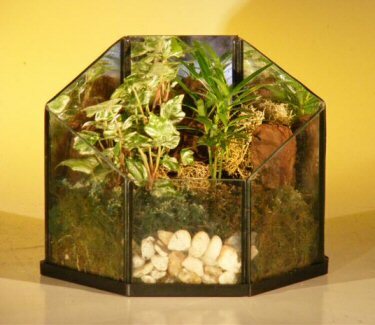 A terrarium is a small, sometimes enclosed, glass or plastic container in which living plants are kept for display. Generally they are miniature, self-sufficient environments. Closed terrariums recycle moisture with high efficiency, but they are more prone to disease than are open terrariums. Open terrariums should be lightly watered or heavily misted every few days and will do very well on a windowsill or on a table near a window. Consists of miniature indoor tropical plants which are considered to be very low maintenance. Container measures 7.5" x 5.5" x 5.5"